What do consumers really want in a premium music service? Playlists. People really care about playlists. What do consumers really want in a premium music streaming service? It’s the record industry’s most important question of the decade. The health of labels, publishers, and creators depends on services’ ability to move listeners up the food chain from free listening to paid subscriptions. Revenue from this top paid tier was 30 percent — and growing quickly — of the U.S. recorded music business in the first half of 2016, according to the Recording Industry Association of America. More growth will be necessary to move the industry further out of its slump. This week Pandora officially entered the premium market with Pandora Premium (there are dozens of hands-on reviews and articles here). Premium is a different kind of paid music streaming service. It’s easy, intuitive, un-cluttered, and for people with a history of thumbs up and thumbs down on Pandora, it’s personalized right out of the box. It’s a very “Pandora” type of product. But does it fulfill what consumers want from a premium service? That’s where the rubber meets the road. What does the market research say consumers want? One theme has stood out in Pandora’s and other market research: playlists. People surveyed want a premium service that excels at building and accessing playlists. In its market research, Pandora found that more than nine in ten people surveyed believe saving songs to playlists is an important feature in a premium service. An equal share of people wants the ability to have quick access to playlists once they’ve been created. Another desirable feature would recommend songs a user can add to playlists. The message is clear: a premium service must get playlists right. Listen to playlists? Tons. Build playlists? Not so much. The dirty secret about playlists is their attrition rate. Premium users have a tendency to abandon their playlists after adding only a handful of songs. 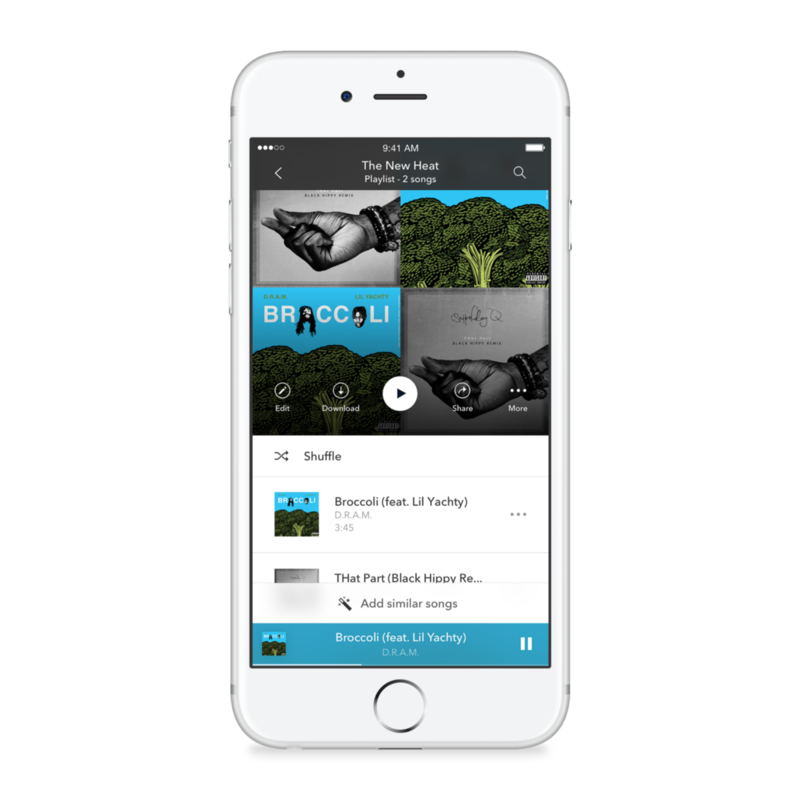 It’s an insight brought to Pandora from the team at Rdio, the premium service Pandora acquired in 2015. In fact, about half of all Rdio playlists had been abandoned after about five songs, a clear sign that users’ enthusiasm for playlists didn’t match their willingness—or ability, given the tools—to create them. On average, according to MusicWatch, playlist makers had created an average of 8.4 playlists, a figure low enough to suggest people’s enthusiasm for creating playlists doesn’t match their ability to create them. In fact, just 40 percent create playlists on a weekly basis. So, three out of five users clearly enjoy playlists but aren’t going through the steps to build them on a consistent basis. There’s the opportunity. A premium service can reach out to the 60 percent of users who could be more engaged. They may have been started with the best of intentions, but when there’s a huge catalog of tracks to choose from, playing the role of music curator can be an intimidating endeavor. So, people clearly want to create their own playlists. But why wouldn’t they do it more often? A 2016 MIDiA Research survey offers some explanations. One cause is the growth of a person’s online collection. When a subscriber’s online collections hits some critical mass, MIDiA says, users would rather spend more time updating existing playlists than creating new ones. It’s not that people stop caring about playlists, but they are less likely to start from scratch. Another factor is the rise of curated playlists. These ready-made playlists relieve subscribers from needing to investing their own time for creation and upkeep. The end result is fewer subscribers that create their own playlists every few months. The playlist and the album: one is a collection of songs, the other is a different kind of collection of songs. To appreciate the importance of playlists is to understand trends in digital music. As the saying goes, playlists are the new album. Downloads were the main digital format of the ’00s. The single-serving track download was an immediate hit — and for good reason. Unlike the all-or-nothing proposition of the album, people could download — legally or illegally — a single song at a time, leading to what’s traditionally been called “the unbundling of the album.” Online playlists at streaming services have picked up where the MP3 playlist left off. No longer bound by the limits of downloaded files — the collecting, the cataloguing, the hard drive space — people are listening to playlists with dozens if not hundreds of songs. As for the album, it’s rarely streamed in its entirety. As MIDiA Research found, streams originating from playlists were 20 times greater than streams from end-to-end listening of an album and nearly three times the number of streams from albums. Those metrics deserves explanation. MIDiA found very little listening comes from listening to an album all the way through. Far more listening comes from people streaming when the album is the source—the listener goes to an album page and picks songs to hear—and far more yet choose a playlist and start listening. That’s not to say the songs are not released on albums, only that listeners tend to choose playlists comprised of songs usually plucked from albums. In all, MIDiA found 62 percent of all streams do not originate from an album. The album isn’t dead, but people have moved en masse toward a different way of listening. When combined, the three market research studies suggest people want to make new playlists but recognize they need help creating them. The desire to make playlists definitely exists, as the research shows: over nine in ten people surveyed believe savings songs to playlists is an important feature in a premium service. But only the ability to create playlists isn’t enough. Nearly all people surveyed also want recommendations of songs to add to their playlists and easy access to them once they’re built. “Add similar songs” kills decision paralysis by helping the subscriber build playlists. Overcoming decision paralysis and solving the paradox of choice. We know people want to save songs to playlists and also get recommendations on which songs to add to their playlists. Pandora Premium kills two birds with one new, unique feature. “Add similar songs,” a tool that builds a playlist with the little effort of pushing a button on a screen. After choosing to start a playlist with a song, each tap of the “Add similar songs” does what the name suggests — it adds five similar songs to the playlist. Like Pandora’s free radio service, Premium is personalized based on a user’s listening history, record of giving songs a thumb up, and the ability of the Music Genome Project to predict with accuracy which song to play. Playlists are like snowflakes; no two will be alike. Even if two people start with the same playlist — or station for that matter — they won’t end up with the same music. This is the killer app, to use an old term, of the Premium app that gets users through bouts of complacency or decision paralysis. Offline listening, a standard feature of the premium service, also scored high in Pandora’s survey. This makes perfect sense. There’s value in being able to download songs without a cellular signal or Wi-Fi access. In fact, both offline and on-demand listening have always been part and parcel to premium services. “Premium” is synonymous with a hands-on experience. Some people are willing to pay a premium to take the music of their choice outside of the house, to the gym, on a plane, in a cave, what have you. Really, the only limit to offline listening is a dead battery. The life-changing magic of tidying up your online music collection. Pandora’s survey also revealed people want quick access to recently heard playlists and stations. Premium recognizes that decision-making often needs a nudge. When a person reads books, a stack of books reveals what’s been read and in what order. When a person listens to vinyl records, the most-played records are usually closest to the top of the stack. On Premium, the app’s home screen organizes a user’s history, creating a chronological, visual history of the recently played playlists, songs, albums and stations. Tucked neatly in the listening history will be a playlist titled “My Thumbs Up,” a collection, also listed chronologically, of all songs a user has ever thumbed up on Pandora. For longtime users, “My Thumbs Up” is like a time capsule filled with former crushes, explorations of different genres, and all-time favorites. All this tidy organization of a user’s music leads to much less hunting and pecking. Until now, premium services have been for super-users, those hands-on early adopters who like to dig through the catalog of tracks. Radio, on the other hand, has been for the lean-back listener who just wants to hear music. That’s a tad simplistic but not a poor way to summarize the streaming music market. After all, building and maintaining playlists, the heart of the premium service, typically requires dedication and time. 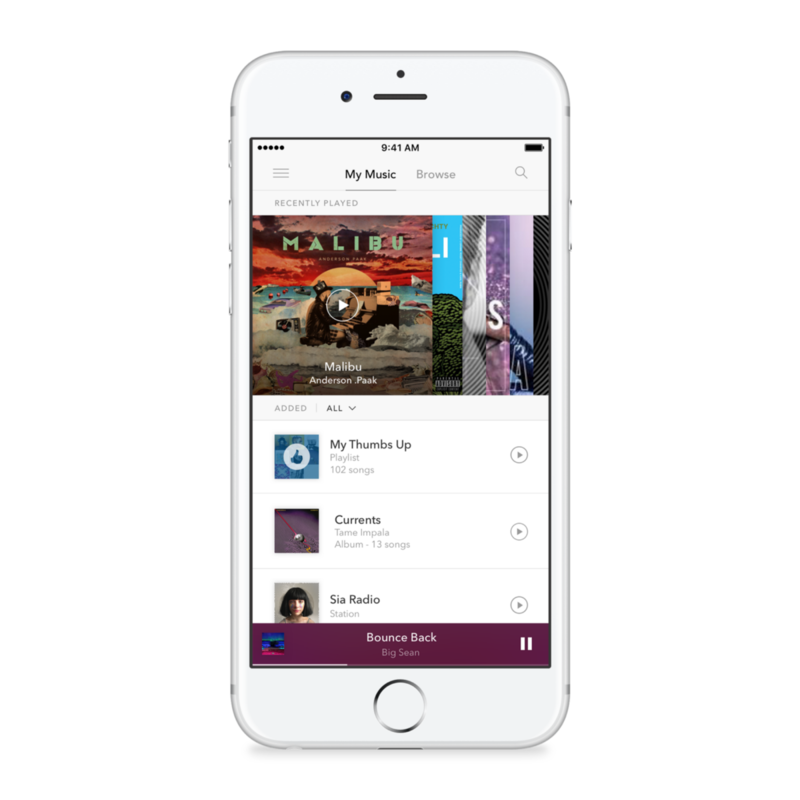 But now Premium enters the market with the ability—especially if the user has a listening history with the free Pandora radio service—to do the heavy lifting typically involved in enjoying a premium service. And it does playlists extremely well. (Radio, too, don’t forget.) That’s mainly what users want from a premium service. And getting playlists right will be required to keep the record industry moving forward.